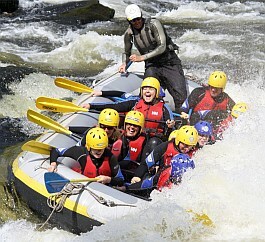 Splash White Water Rafting Scotland offer the widest range of white water rafting trips available in Scotland. We have been running rivers in Scotland and abroad since 1996 and have looked after in excess of 100 thousand clients in that time. Our River Guides are the essence of our business and they are all trained to International Rafting Association standards as well as swift water rescue and outdoor first aid. Many of our team are also qualified in many other outdoor and adventure activities. 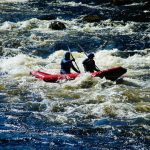 Our rafting trips range from introduction trips to fun and adventure rivers such as the River Tay Aberfeldy and the River Tummel Pitlochry to adrenaline-pumping rivers like the River Orchy Rafting and the River Findhorn Rafting. Splash Rafting is based in Aberfeldy in Scotland, are the only company to run the River Orchy on a regular basis during each winter season. This is a high adrenaline grade 5 river. 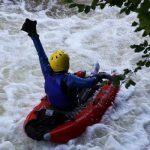 When thinking about Scotland white water rafting why not try a One Day, Two Rivers which includes the River Tay Rafting and the River Tummel Rafting. 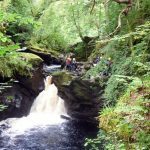 This one-day event lets your experience two great rivers in Scotland in one day! 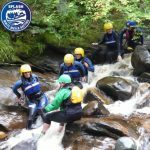 The ever in demand white water rafting River Tummel trip only runs on weekends June-Sept and gets sold out every weekend so book early for that one. As well as the rivers below we run the River Braan and the River Awe to order. 3. Luxury 4-star self-catering accommodation and hotel with swimming pool and sauna for those that require overnight accommodation. Also other accommodation options available for those that require to go with their activities. Finally (but most importantly) a fun and adventure-packed adrenaline-packed experience – run as safely as our years of experience can make it.